Surprise your loved ones/friends this birthday with a handmade card, or rather a handmade birthday present pop up card instead! This captivating card opens up to two boxes of presents popping out. The presents come in wrapped packages, complete with ribbons and bows as well! 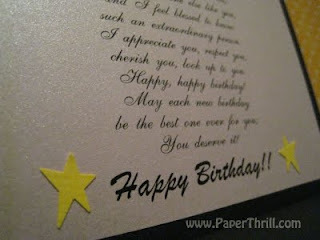 Flourishing vines are handstamped on the inside of the card, while the front of the card is kept really simply. 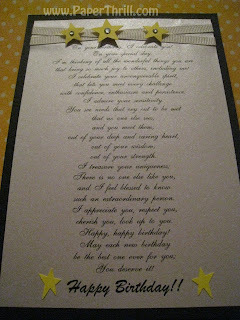 This creates an element of surprise when the card is opened. Totally delightful and 'pop-a-licious'! Highlighting the beauty of nature, this handmade wedding invitation is perfect for any season. It's simply lovely to sit and watch tall wheat grass dancing with the breeze. It tells us to slow down and enjoy each moment we have with each other. This beautiful handmade invitation captures the essence of it all, in its quiet and unassuming way. Silhouettes of the wispy wheat grasses are handstamped in shades of green on a green marbled paper. Small flowers dance at the bottom to highlight the beauty of it. 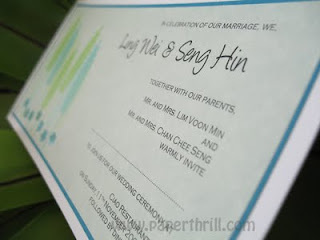 A teal coloured cardstock is then layered between it and the textured white-based matte cardstock. This handmade wedding invitation looks simply divine with its vintage floral swirls adorning the top and bottom corners of the card. The swirls were hand stamped generously in a shimmery dark champagne colour on an pearlescent ivory paper. 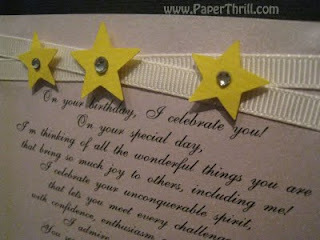 It is then layered on a silver based cardstock. A white satin edged organza ribbon is tied with a bow around the card. A very simple and classic design, yet it exudes a whole lot of class and style!